Apparently, successful restauranteurs consider signage an expense they can do without. Why incur the cost of mounting the restaurant’s name over the door when fifteen people blocking the sidewalk out front before the noon opening time provide the best advertisement? 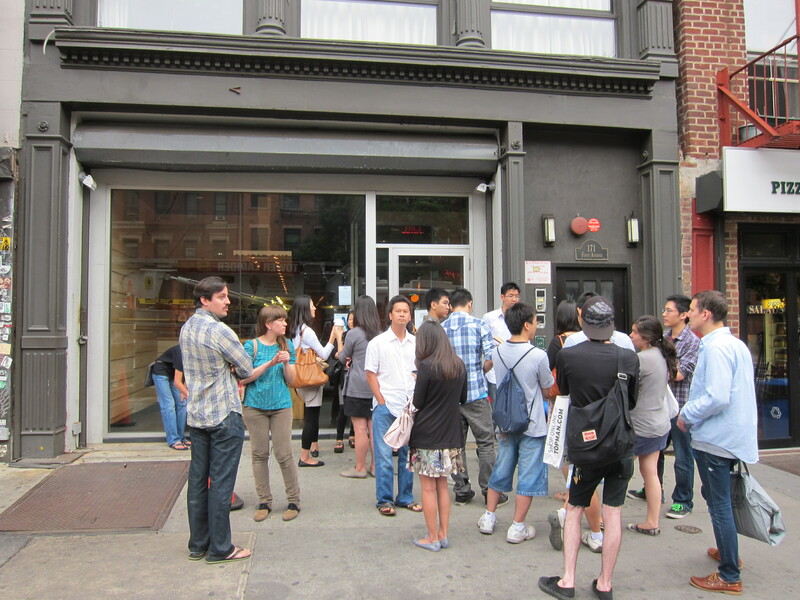 And so, on a recent Saturday early afternoon in New York City, I had no trouble locating David Chang’s Momofuku. Nor did I have trouble snagging a seat at the bar. All the tables were filled immediately, but for the first fifteen minutes that Momofuku was open, I was the bar’s only occupant. 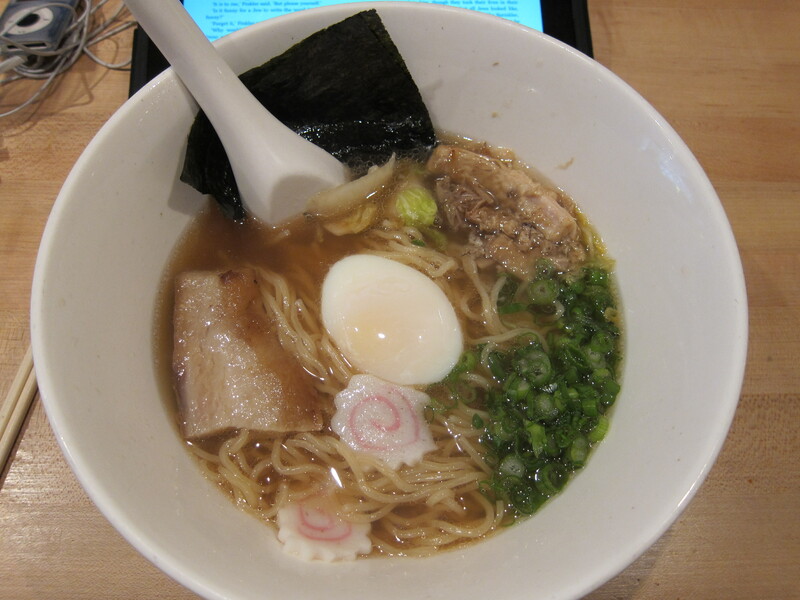 Initially, Momofuku was not on my to-do list when I blew into town two days before. I had my sights set on Danny Meyer’s Maialino. That was, alas, not to be. So, on my way to meet up with family on Saturday morning, I took a detour and stopped here. The blond wood-lined noodle bar is young and hip with a diverse clientele. At one point, I was distracted by a very earnest conversation between a nerdy black man and one of the servers about the possibility that one of the desserts might not in fact be vegan. The menu invites diners to call out their food allergies to their servers. Having no food allergies or aversions whatsoever, I started with a soy egg, which turned out to be two halves of a hard boiled egg, whose surface was stained in some mysterious way a pale taupe by soy sauce. Fried shallots and finely chopped chives were sprinkled on top. Then, the menu presented me with a choice of Brisket Bun with horseradish, pickled red onion, and cucumber or Smoked Chicken with noodles, black bean and soy egg. I chose the brisket and wasn’t sorry. The meat was at its most tender. I tasted some light touches of Chinese 5-spice. The layer of fat added additional sweet notes. The horseradish provided some bite. 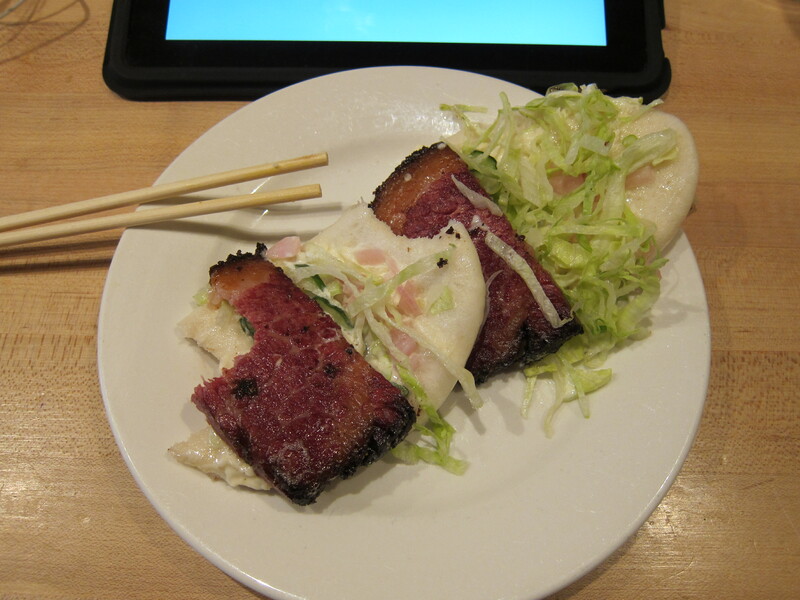 What impressed me most were the cloud-like steamed buns that were shaped more like flatbread. I folded the bun around the meat like a taco and lifted it to take a bite. This was the highlight of the meal. I wish Chang had included the recipe for the brisket in his book. After all my effort to make Chang’s ramen broth at home, I had to try the real thing. To my surprise, I was a little disappointed. I wished each of the ingredients were prepared a little differently. I’ve decided I’m not wild about the smokiness of Chang’s broth (it calls for smoked bacon among other things). That’s just my personal preference. I also thought the pork belly would have been better crisped and the pulled pork shoulder better seasoned. Finally and, again, to my surprise, I thought the noodles were a touch too soft. But that may be my fault. I’m used to saying “less boiled” or “firm” when I order ramen. I didn’t expect to have to say it here. But don’t let that discourage you from trying to eat here. The menu isn’t long, but I saw in it at least two subsequent trips to Momofuku. The buns alone are worth the visit. I’m going to try to make them myself at home. I just found your blog while searching for a Rick Bayless pork recipe. I’m so glad I found it. Love your blog and I just subscribed. Thanks!